It starts with typical fear-mongering about how America is doomed to destroy itself largely by the actions of liberals. Don’t get me wrong, I think the agenda of the liberal leaders is absolutely wrong. I just know that blaming them for everything is what has gotten us into trouble as a country. Both “sides” get us hating and fighting each other so we don’t pay attention to how both are screwing us. Sorry, its hard to ignore politics when reading a political book. D’Souza’s book is just that. It is not an analysis of what the world would be without America. It is not a look at the effect the US has had on the world stage. It is simple grandstanding political hyperbole – nothing more. I only noticed the book because I saw it was already out as a film. I was intrigued by the title and hoped so much for an adventure in intellectual experimentation. I was hoping some realistic look at this “what if” scenario. Last I saw, the Rotten Tomatoes rating for the film was hovering around 7%. That made me feel good about the movie-going public. 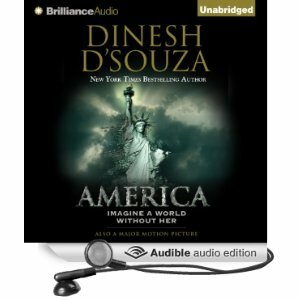 Sure, he makes some great points about what is wrong with liberalism and the “progressive” movement, but D’Souza isn’t going to win any converts with this book. Those who agree with him will cheer along. Those who disagree will denounce it as right-wing hate mongering. There is nothing to be gained from this book. It adds nothing to the conversation. It says nothing original. It just adds more noise to the arguing. Don’t waste your time with this book. I am not going to waste my time linking to it.